Viking Vessel offers advanced welding, tanks & vessels, fabrication, process & power piping and plant maintenance to the Power, Petrochemical, Refining and General Process Industrial markets. Viking Vessel is a unique company in the aspect of ownership. John Null, President of Viking Vessel, brings a practical, hands-on approach, with employee training and Quality Control systems, implementations and management, brought from his experience as owner and operator of NIA Consulting & Welding Inspection, LLC. Marshall Hicks, Vice President, has successfully operated Superior Machine and Construction, with extended knowledge in Industrial Maintenance & specialized fabrication in the Oil & Gas, Telecommunications, Construction and Engineering Industries. SCANDM holds a meticulous safety record, with over 125,000 recorded workman comp hours with no incident. Safety, Quality and Throughput/On-Time Delivery. Safety: It is Viking’s responsibility and commitment to our customers and our employees to produce an educated and cohesive safety environment, well documented with continuous improvement and training to OSHA standards, customer safety standards and industry requirements. Quality: Quality is our legacy and highlights our craftsmanship. We achieve a high level of quality through proactive planning on a project by project basis, with clear lines of communication and an In-House welder training program taught by a Certified Welding Inspector and Certified Welding Educator. Viking teaches the fundamental understanding of drawings, welding symbol detailing, Welding Procedure Specification interpretations, Visual Inspection procedures, and Inspection tool and techniques. All projects are assigned a QCI (Quality Control Inspector), recording critical data, and all projects filter through the QCM (Quality Control Manager) and are thoroughly documented and put on file. 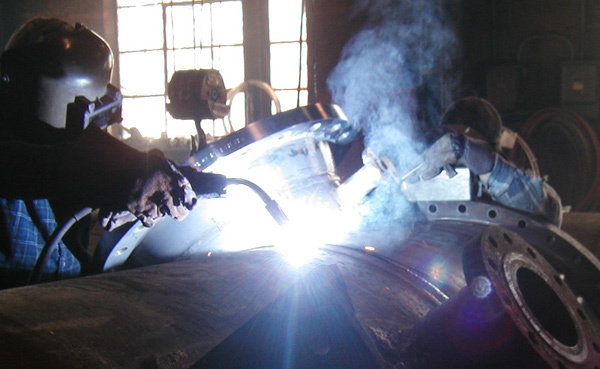 Manual: GTAW (Gas Tungsten Arc Welding) plus GTAW-Pulse, SMAW (Shielded Metal Arc Welding), PAW (Plasma Arc Welding). Semi-Automatic: FCAW (Flux Core Arc Welding), GMAW (Gas Metal Arc Welding) plus GMAW Pulse, Short Circuit & RMD. Automatic: SAW (Submerged Arc welding) and Orbital Welding. These processes are dependent upon the atmospheric environment and the accessibility of the welding joint. Viking Vessel has highly skilled,certified welders that hold documented continuous education records in the above processes. Combining these three principles leads to a conducive environment for a cutting edge on-time delivery system. Viking Vessel is a team-orientated culture that guarantees to deliver a safe working environment, a prideful workmanship and a willingness to say what we do and do what we say.